that is, telling a lie to someone because they expect you to tell the truth because they think you think they think you think they expect you to tell a lie, neither the agent nor the agency can distinguish sense from dissemblance. The information becomes meaningless. 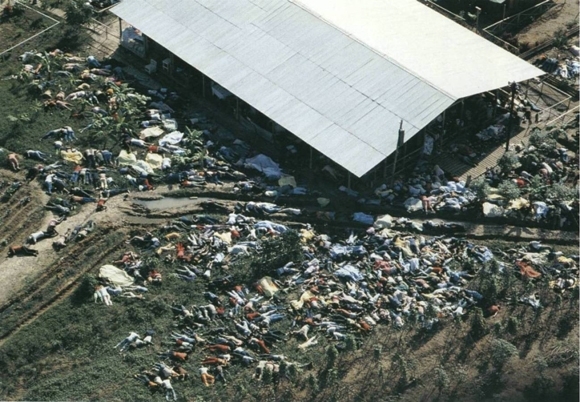 On Saturday, November 18 1978 more than 1000 American citizens, members of the People's Temple religious commune called 'Jonestown' situated in the jungles of the tiny South American country of Guyana, were directed by their leader, Rev. Jim Jones, to commit an act of 'revolutionary suicide' by drinking cyanide-laced grape Kool-Aid. Earlier that day Peoples' Temple members had shot and killed Congressman Leo Ryan and several reporters and Jonestown defectors as they attempted to board a plane for home. A week later, the U.S. military forces controlling the cleanup and investigation reported the final body count of 913. Jones believed, and had convinced his constituency, that death by painful cyanide poisoning was the only recourse in the face of the torture awaiting them at the hands of the CIA, FBI, the State Department and whatever other factions of the World Government felt threatened by the success of this 'model revolutionary interracial socialist commune'. Paranoia is a psychopathological disorder characterized by hypersensitivity to slights or blame, suspiciousness, mistrust, extreme jealousy, and vengeful feelings. As a psychotic syndrome, feelings of persecution, and delusions that one is being spied upon, plotted against, or secretly betrayed, or that one is secretly the heir to the French throne or George Michaels' wife are typical. In its most extreme schizophrenic form, such delusions become more far-fetched, involving aliens, mind-control implants, historical or supernatural personages, etc. and are buttressed by auditory and sometimes visual hallucinations. All this is well and fine when contained within the personality boundaries of an individual designated as sick. The difficulties begin, and in a sense expand in an exponential torrent that defines History, when two or three are gathered together in His name. The social analogues of paranoid states have been fodder for the baroque and illuminating discourses of Foucault and R.D. Laing (not to mention Kafka and Doris Lessing), but should be familiar enough in all their unmediated existential glory to anyone who has worked in an office, gone to grade school, lived in a family, or tried to make it in the art world. Consensus is a mercurial commodity, and much of our attention is justifiably sacrificed in attempting to assuage it. But when your workaday paranoiac social system achieves a certain level of isolation- when reality testing is unilaterally abandoned for reality policing- there occurs a figure/ground shift between what has heretofore been 'subjective' and 'objective'. That's when you get the Voices. The hive-mind of the cult is perhaps the most easily, widely diagnosed manifestation of paranoia in a cultural body. Another such group, popularly qualified delusional but less neatly contained , is the unevenly woven network of conspiracy theorists that developed after the JFK assassination, a family which technically includes everyone from the man on the street who believes that sometimes the government lies to him for reasons other than national security to, well, the late population of Jonestown. Conspiracy theorists took Jones' pronouncements about his 'enemies' seriously. Mark Lane, who played a major role in getting the conspiracy ball rolling as Lee Harvey Oswald's court-appointed attorney and best-selling author of the Warren-Commission-shredding Rush to Judgement (and himself the object of much sinister speculation in some conspiracy circles), had been hired by the Reverend in September of 1978 to represent the Peoples' Temple and take legal action against its government persecutors. Lane held a press conference announcing his intention to prove the conspiracy, and was in Jonestown when the much rehearsed suicide drill of 'White Night' became a reality. Improbably, he was one of 16 known survivors. Given this connection, and the then-recently disclosed program of massive infiltration and assassination by federal and municipal police forces called COINTELPRO, which had targeted just such political and racial experiments, it was inevitable that the Jonestown massacre would attract substantial Conspiracy Theory attention. As information came to light, though, in spite of the stringent dose of skepticism with which official Army Intelligence press releases must be interpreted, it became obvious that not only was Jones not a counterculture savior, but he had been engaged in systematic physical (including sexual) and psychological torture of his flock, extorting deeds to mansions or Welfare checks, consuming and dispensing massive doses of icky psychoactives (speed for himself; thorazine for the believers), and sundry distasteful entertainments. Jones was revealed to have had connections with the CIA, and to have played a major part in various suspicious municipal transactions as Chairman of the San Francisco Housing Authority board. Eventually, conspiracy research linked Jones to the murders of Harvey Milk and Dan Moscone, John Lennon, Martin Luther King and Martin Luther King's mother, as well as to the attempted assassination of President Reagan and alleged suicide of Vatican Bank/Freemason/Mafia scandal MVP Roberto Calvi. Jonestown itself was identified as a new model interment camp organized under the auspices of the CIA's MK-ULTRA program of mind control experiments, possibly one of many such camps, its lineage traced back to American Intelligence policies of relocating valuable Nazi spooks and scientists under programs like ODESSA and Operation Sunrise, and the tacit sponsorship of their continued researches. Much of Jones' $2 billion fortune vanished without a trace, and the possibility remains that hundreds of brainwashed robot assassins- graduates of Jonestown- walk among us, awaiting only simple trigger words to unleash their havoc. Some evidence suggests that Jones himself escaped Guyana, or, alternatively, that he had been dead for years, replaced by one of the more pliable 'doubles' he is known to have kept around to confuse would-be assassins. This is all, quite literally, beyond doubt. The provisional suspension of doubt in order to explore the possible permutations that might result from a given set of possibilities is essential to any creative act, including the intricate and involuted speculative labyrinths that constitute conspiracy theories. After the first leap of faith is concealed by a few layers of multivalued logic, one is free to abandon both this tentative postulatum and the hypothetical end point that will resolve all loose threads, and blow freely. In conspiracy-minded 'fictions' such as Pynchon's Gravity's Rainbow and The Crying of Lot 49, Wilson & Shea's Illuminatus! Trilogy and Stone's JFK, the aesthetics of conspiracy theory are raveled to their logical and curiously similar ends: a womb-like dissolution of criteria to discriminate among competing realities, where every point in the matrix is equally suffused with meaning. Gnostics heretically believed that mankind is in paradise here and now, but our consciousness is veiled by the lies of a psychotic false god. It is an article of faith that all data perceived through the senses and mind is tainted, and holds us back from the realization of Creation in its undivided wholeness. Paranoia is, in a sense, the force of progressive modernist thought processes turned aside, exploring and identifying as meaningful the endless fractal nuances of mundane reality, a hemorrhaging into the moment of designated significance previously held at bay by the structure lent it by the dynamic of time, with no destination save for the realization that we're already there. Conspiracy aesthetics derive from the variety of configurations that emerge, the molecular choreography of interconnectedness ultimately signifying nothing except the structure of the human mind, the structure of reality, and the no-man's-land that lies between. As a post-modern millennial passion play enacting the somatic paranoia underpinning even our most innocuous social alliances, Jonestown provides a crude but moving cautionary tale: for most of us, locked in History as we are, a workable lie is worth more than our life. Or so some would have you believe.